The Local Wood Challenge – The Wood is in the Hood! The European Guitar Builders association is happy to announce that the fifth edition of The Holy Grail Guitar Show will return to the Estrel Berlin on Saturday & Sunday, May 2 — 3, 2020. 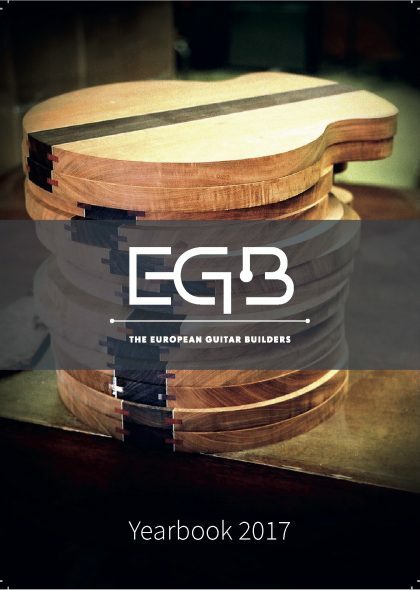 Until then, we invite fans of the handbuilt guitar to visit with EGB members at various events this fall and all through 2019, dates and event information can be found at http://www.europeanguitarbuilders.com or on our Facebook page https://www.facebook.com/europeanguitarbuilders. The 2017 EGB Yearbook now available online! Click on the image to download your copy of the 2017 EGB Yearbook! See attached .pdf for more information on the logistics support Make'n Music now offers to EGB members! More reports from the wonderful 3-day weekend in Vienna will follow, but here a first preview from our community build projects! Some of the vendors are extending special offers to you, click on the link below for these offers. Be aware that these are deals offered by the companies directly and the EGB has no involvement in orders, payments, or other related issues. CLICK HERE FOR THE DETAILED PROGRAM REGISTER NOW! Started at the EGB Symposium 2017 this exciting new community project will run until The HGGS 2018. Check it out here! Reviews and recommendations for your next book purchase. Introduced at The HGGS 2016 this ongoing project supports ongoing activities to increase the awareness about the positive aspects of building and buying guitars made out of ‘local’ wood. Instruments and builders that should not be forgotten are displayed and celebrated at the HGGS. The European Guitar Builders 2015. All Rights Reserved.